Hyundai Santa Fe Sport and Santa Fe seven-seater unveiled! Hyundai unveiled the next-generation Santa Fe Sport five seater SUV and Santa Fe seven seater (long wheel base LWB) variants at the 2012 New York Auto Show. The new Santa Fe is expected to hit Indian market by 2012 end or early 2013. The Santa Fe showcased at the Expo looks very close to the official images of the prototype that Hyundai unveiled last month. Read more: Next Gen Hyundai Santa Fe official photos. The new Santa Fe adopts Hyundai’s fluidic sculpture as seen in the Sonata and the Verna. The bold hexagonal grill have angular slits while the thick black housing for the fog lamps give the Santa Fe, a distinct look. The side profile reveals the high shoulder line that is steeply raked at the C pillar, a characteristic design found in the small car Hyundai Eon. The mildly pronounced wheel arches hints the ‘soft-roader’ nature of the Santa Fe. 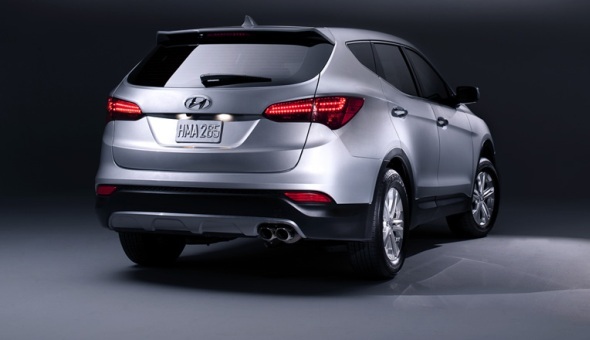 At the rear, the side swept LED tail lamp cluster penetrates into the boot door giving the SUV, a premium feel. With regard to dimensions the Santa Fe LWB seven seater version measures 4,904 mm in length, 1,885 mm in width, 1,690 mm in height and has a wheel base of 2,799 mm. When compared to the present Santa Fe sold in India, the new Santa Fe is 244 mm longer and 99 mm larger wheel base. Hence, expect the upcoming Santa Fe to offer more legroom for all three row passengers and a slightly larger boot space as well. 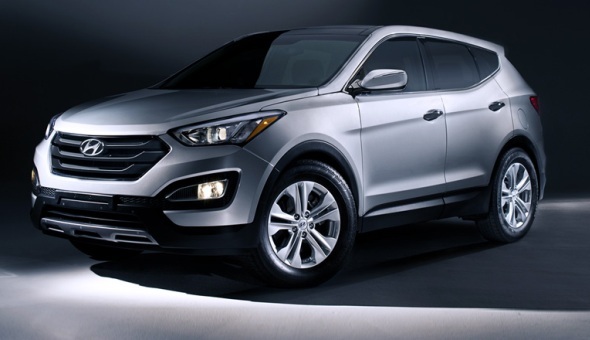 The brochure images of the Korea-specific Santa Fe were leaked couple of weeks ago. Based on this, for the Indian market, expect Hyundai to offer a 2.2-litre R-series diesel engine that puts out 221 bhp of power and 500 Nm of torque. This will make the upcoming Santa Fe more powerful than the present model which is powered by a 2.2 litre CRDi diesel engine that makes 195 bhp of power and 420 Nm of torque. In terms of price, the new Santa Fe may be priced marginally higher than the present model which has a price range of Rs. 22.34 lakh – 25.37 lakh. The upcoming Santa Fe will have to compete with the Toyota Fortuner, the Ford Endeavour and their likes.